Members of Newday Church Donate Relief Funds For Aleppo and Mosul » An event in Bethlehem one silent night 2,000 years ago, changed the world forever. Believing that Christmas can still change our world, members of Newday Church set out to be God’s agents during the 2016 Christmas season. For the past decade, church members have raised money at Christmastime for global organizations that tackle social issues they believe Jesus cares about. Each year, they stretch their giving. They “spend a little less so that they can give a little more,” explains Kim Kennedy, church member at Newday. In the past, they donated as much as $36,000. This year, with $40,000 in matching funds, they collected $96,400, an impressive amount that is already on its way to help people around the world whose lives are not as comfortable or as safe as our lives in the United States. World Relief, an organization supplying refugee families in Aleppo, Syria and Mosul, Iraq with the essentials they need to survive was selected as one beneficiary. 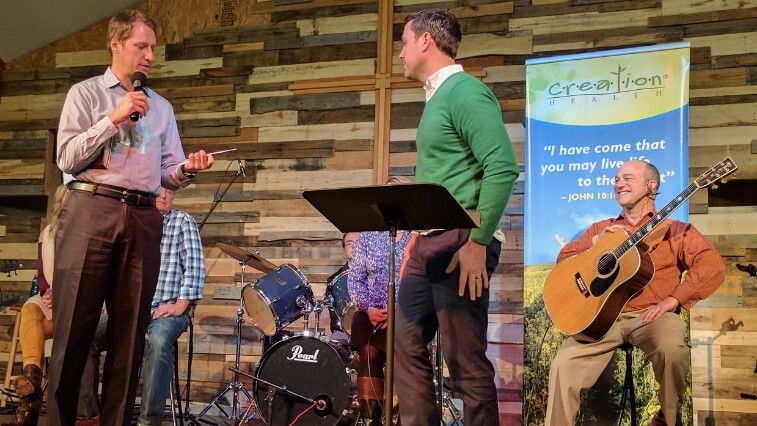 On Sabbath, January 14, World Relief’s church partnership coordinator, Mark Lamb flew in from Seattle to personally thank Newday’s members and receive their check for $40,000. Another recipient of Newday’s generosity, International Justice Mission, is an organization that tackles injustice and modern-day slavery. They will receive a check for $45,000, an amount that will fund six rescue missions much like the operation that took place this month in Manila where nine boys and girls, ranging from 2 to 10 years in age, were rescued from two separate homes. Caring for their neighbors who need a hand up is a way of life for Newday. They have benefitted Parker Task Force/Food Bank in previous fundraisers. Last month, , they gave $10,000 to this food bank, a non-profit dedicated to providing individuals and families in their community with food and other resources to help them become self-sufficient. 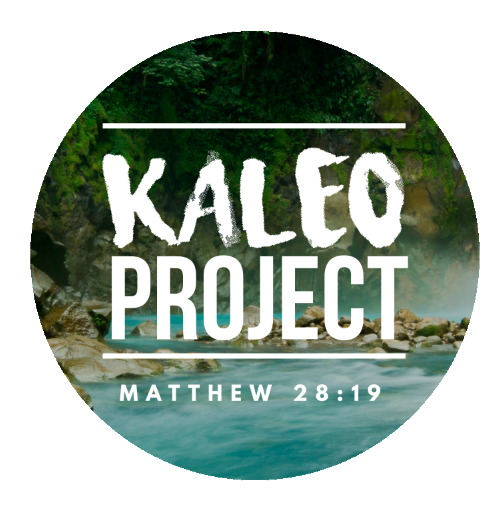 The final $4,400 from the total raised by Newday will go to Iquitos, Peru to build a church there along with a home for an elderly woman. 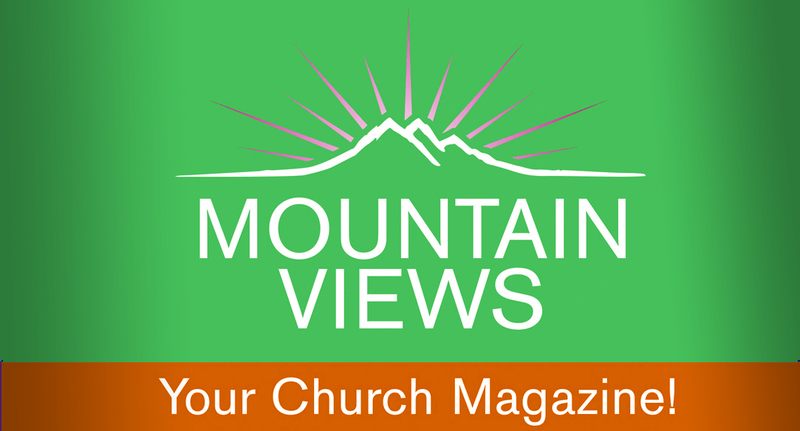 New Outreach Methods to be Discussed at RMC Pastors' Conference » The annual Rocky Mountain Conference Pastors’ Meeting, January 29-31, will focus on methods of evangelism that have brought success, according to Craig Carr, RMC ministerial director. “There are many such examples to be showcased at our annual gathering at the Glacier View Ranch,” he said. Ministers from across the vast RMC territory of Colorado, New Mexico and Wyoming will again have a networking opportunity, spending time in prayer, and exchanging their challenges and stories of how God is blessing His church. Carr explained that the “creativity of pastors and the willingness of churches to think inside and outside the boundaries of traditional evangelism has reaped dividends of growth.” This will be one of the program items at the meeting. Several pastors from across RMC will be sharing their experiences and outcomes with the group. As with each such gathering, special visitors will include Charles Byrd, producer from QuestLine Productions. He will showcase a unique way of sharing prophecy presentations called, Thunder in the Holy Land. He will be followed by Shawn Boonstra, speaker/director of Voice of Prophecy, sharing the upcoming new media series planned for the latter part of 2017. When the Holy Spirit Took Charge » It was nearly 8 p.m. the night three members of a Colorado prison ministry team arrived at Crowley County Correctional Facility to baptize an inmate. The candidate, Richard, had already waited two months. Yet, each time it was scheduled, something happened to prevent it. Once, it was so cold, the sprinkler pipes in the chapel froze and they couldn't fill the baptismal tank. Another time, Pastor Ted Williams arrived late and the prison officials wouldn’t allow the baptism to take place. Finally, on Friday, January 13, it was scheduled again and Richard, a graduate of the Discover Bible Course, waited eagerly. He’d already met with the pastor and considered the import of this step. This night, Pastor Ted left early to avoid heavy traffic. Joining the other two members of the ministry team at the prison, he prayed, asking for the Holy Spirit to take charge of the evening. But when the guard escorted them to the chapel, they discovered not only was it filled with Messianic Jewish brothers, but the baptismal tank was piled high with all kinds of material. After a brief discussion, the two groups agreed to hold a blended service. The watch commander came to say the chaplain was completely apologetic, but they’d have to reschedule. “We’ve already talked with the Messianic Jewish group,” explained Pastor Ted, “and they’d be happy to have a blended service and share in this baptism.” The Jewish clerk nodded his head in agreement. &nbsnbsp;“That’s absolutely no problem,” the chaplain said, meaning it was okay to hold the blended service, “but it’s already 8 p.m. and services will be over at 8:30 p.m. It will take 30 minutes to fill the baptismal tank. “How would you feel about letting the Holy Spirit take care of this?” asked Pastor Ted. With a nod of approval, they headed back to the chapel. It was 8:07 p.m. and with everyone’s help, they moved the baptistry and measured the baptismal candidate to see how much water was needed. Within ten minutes, it was full enough for a baptism. The Messianic brothers and the Adventist brothers waited expectantly as Pastor Ted talked about the meaning of baptism. He told them that a party was getting ready to start in heaven. Several of the Messianic brothers prayed and Pastor Ted’s prayer followed. “I don’t know you,” said Pastor Ted, “but the Holy Spirit does. I now baptize you in the name of the Father, the Son, and the Holy Spirit” and he submerged the second candidate. A third man came forward then saying, “I haven’t been in services for two months, but I hear the call. Will you baptize me?” So a third baptism took place and they praised God together. Then they prayed together. And the clock read 8:27 p.m.
Nedley Depression and Anxiety Recovery Program » The Durango Church is holding a depression and anxiety treatment program which offers non-drug solutions designed to combat depression through improving energy levels, sleep quality, mood, relationships and emotional intelligence. The eight-week program begins January 23 at the church, 1775 Florida Road. For more information, call Marley at 970-749-1860. Diabetes Undone » The new Castle Rock church plant is holding an eight-week Diabetes Undone program from 7-8:30 p.m. January 17 to help stomp out this medical epidemic. 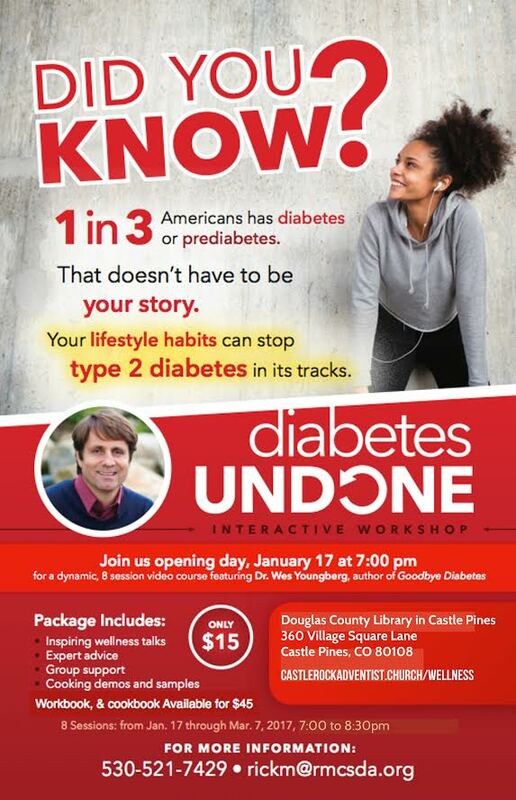 Held at the Douglas County Library in Castle Pines, it is open to all -- those with diabetes or pre-diabetes, those who want to prevent it or have friends who want to prevent it, or those who want to learn how to organize their own event. The cost is $15 with optional workbook and cookbook available for $45. For more information, call Rick Mautz at 530-521-7429 or send an email to [email protected] Visit our website at http://castlerockadventist.church. You might get that impression when you receive an invitation to our first open house -- Sabbath, January 21, 9 a.m. - 12 p.m. -- since most open houses are for the purpose of selling property. But there is no need to panic. We are not selling. We are not moving. We are simply re-launching our church in our local community. 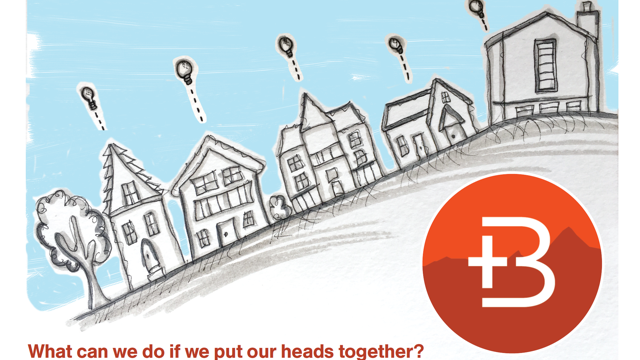 After a three-year journey in which we've made our church a place where we can comfortably invite neighbors and serve as the local community hub, we are ready to share new ideas as well as the blessing of the Gospel with the wider community. If Boulder Adventist Church closed down tomorrow, would our neighbors notice? Would they miss us? We certainly hope so. 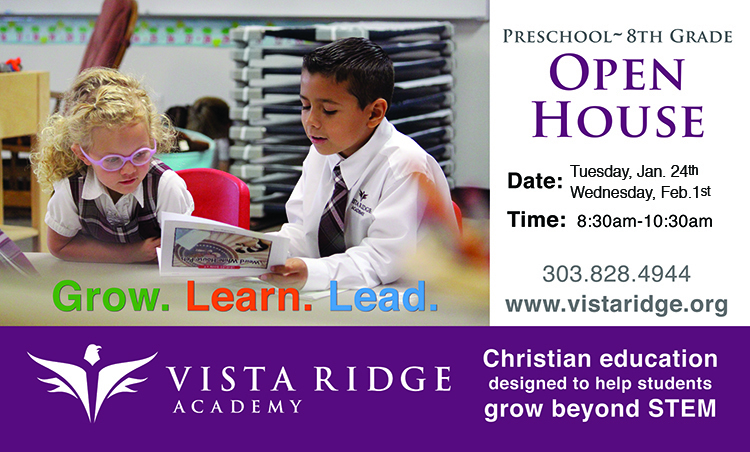 The open house will include our usual worship service and kid's Bible study classes. Following the service, we will offer an open neighborhood forum, featuring a 20-minute message by Pastor Japhet De Oliveira on the value of neighbors, along with a discussion period to share ideas on how the church and community might partner together to make our neighborhood a better place. A ministry fair will allow church members and neighbors to get involved with current projects. Refreshments will be served. 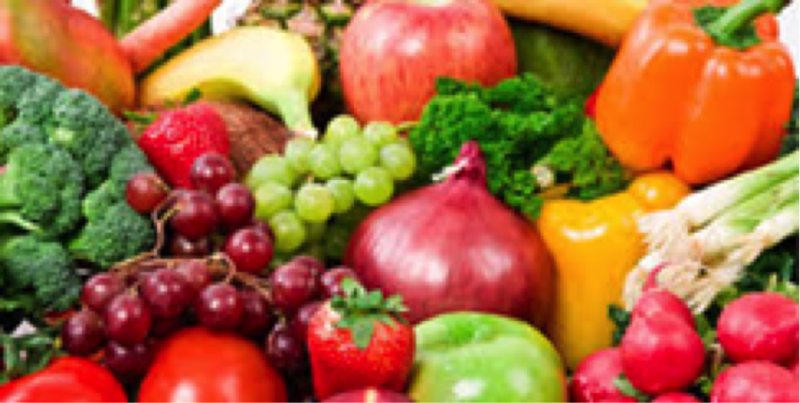 Vegan Cooking School » The Longmont Church will host a vegan cooking school at 7 p.m. the evenings of January 24, 26, 31, and February 2. This is a FREE cooking school and all are invited. For more information, contact Lisa at 303-774-7612. The church is located at 1712 Mountain View in Longmont. 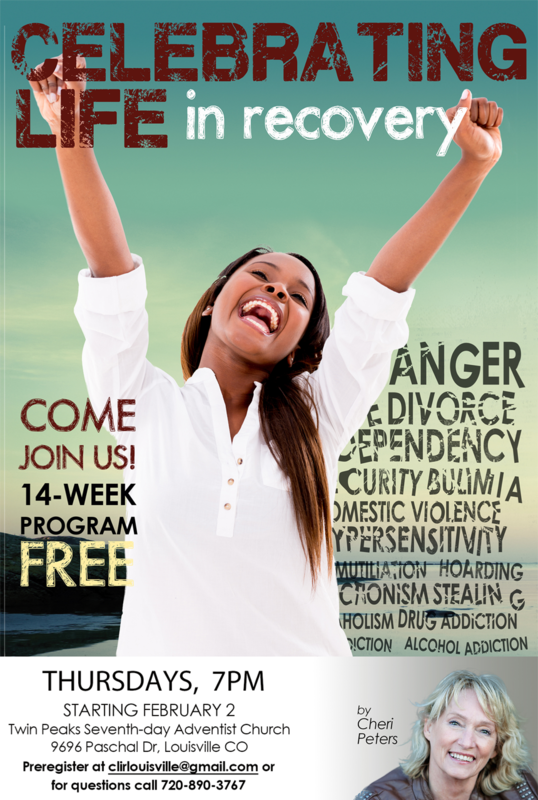 Celebrating Life in Recovery » Twin Peaks Church is holding a 14-week program presented by Cheri Peters to help with recovery from domestic abuse, perfectionism, alcoholism, drug addiction, anger, dependency, and so much more. Join this FREE program at 7 p.m. Thursdays beginning February 2. Preregister at [email protected] For questions, call 720-890-3767. The Twin Peaks Church is located at 9696 Paschal Drive, Louisville, CO.